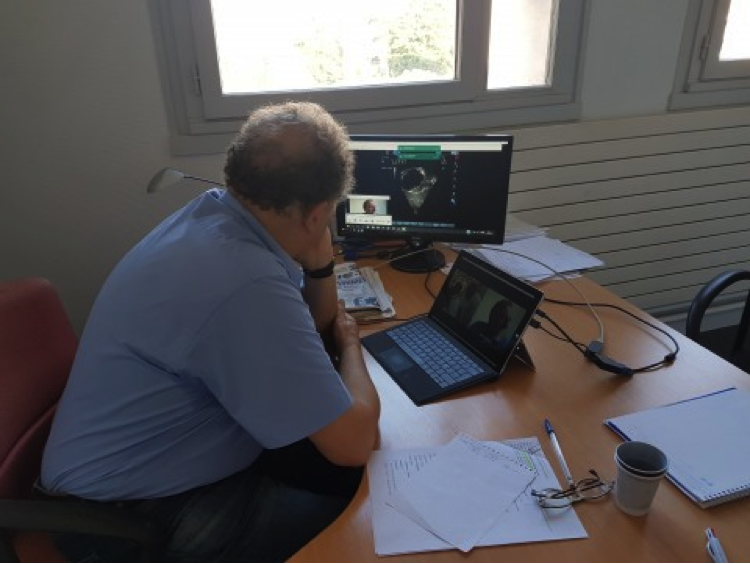 For the first time on Wednesday, September 21, the team of Dr.Philippe Adjagba at the Cotonou Polyclinic in Benin participated in a remote ultrasonography with Professor SIDI, in Paris. Two patients suffering from congenital heart defect (CHD) were examined. As the exam was highly conclusive, the Polyclinic will now be connected every week with Professor SIDI at La Chaîne de l’Espoir Paris. 3 new patients were seen on Wednesday, September 28. ECHOES is a remote live echocardiography programme launched by La Chaîne de l’Espoir a year and a half ago. Every week, Prof. Sidi, but also Dr. Alain Berrebi among others, give their time to accompany and advise their colleagues remotely. To date, the ECHOES programme has enabled more than 700 children to be seen in 7 different countries. The objective is to provide vocational training to the local medical teams of La Chaîne de l’Espoir and better diagnose patients. Initial testing of the online ECHOES platform is currently ongoing. The long-term objective is to allow more hospitals to be connected to more experts.